So do you guys REALLY want to know how fun and awesome Creative Estates was? 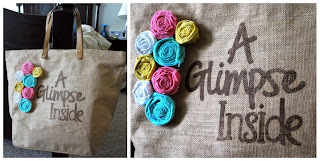 First off, I HAVE to share with you the FABULOUS bag that I got to take to Creative Estates. Kellie from the Blog, This Blessed Nest, has an etsy shop Bag Full of Posies and she makes the most adorable bags. 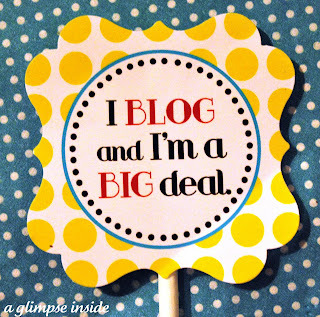 So I had to get one with my blog name on it to sport it at a blog conference. And everyone LOVED it just as much as I do. Thursday I flew in and was lucky enough to fly the whole way with Kristen from Ladybug Blessings. I was so thrilled to fly with someone there that way I wasn't completely alone, letting my nerves calm down. I'm a pretty shy girl until I get to know people so flying with Kristen REALLY helped! Once we arrived in Phoenix, Kristen and I went our separate ways and I met up with my awesome roommate, Gina from Hiya Luv. Both our flights were delayed so we were late to the Cupcakes and Cocktails Social. We were both so nervous walking in late but it was great. 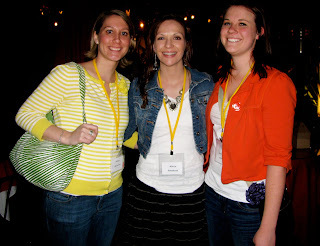 Me with Alison from Oopsey Daisy and Lauren from The Elephant's Trunk at the Cupcake and Cocktail Social. 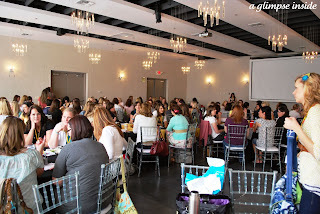 It was amazing being in a room filled with 170+ Creative Bloggers and Handmade Business Owners. 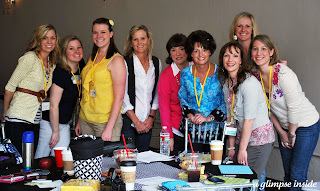 I sat with some FABULOUS ladies on day one. 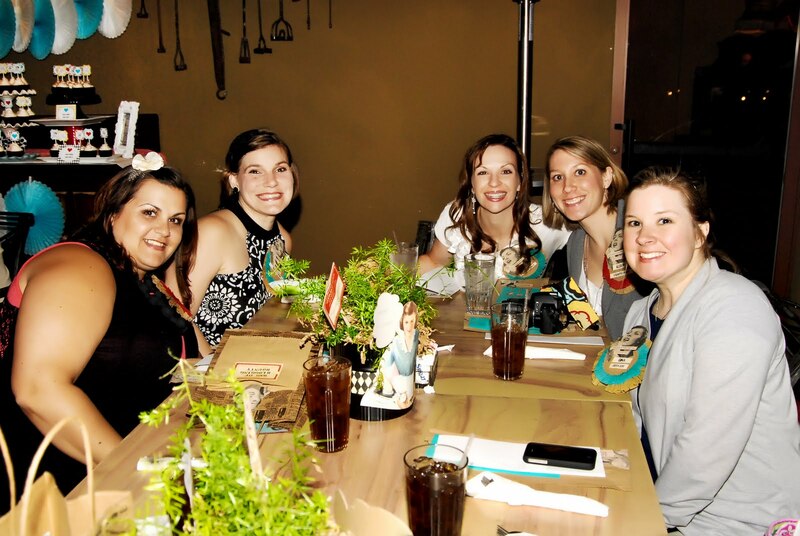 From left to right: Becca (Blue Cricket Designs), Gina (Hiya Luv), Lauren (The Elephant's Trunk), Lauren's mom, Trish, Chrissy, (Hoot Designs), Alison (Oopsey Daisy), Jennifer (Scissors and Spatulas), and me. There were a few sessions we could pick from and I choose to go to the session about Blogging Tips with the awesome panel made up of Amy (The Idea Room), Jen (Tatertots and Jello), Cindy (Skip to my Lou), and Kim (Today's Creative Blog). They shared some excellent tips. I truly LOVED meeting these two ladies, Alison (Oopsey Daisy) and Bev (Flamingo Toes). They both are the sweetest! 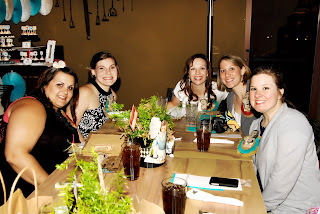 Friday Night, some of the lovely AZ ladies had a Girl's Night Out at the Old Spaghetti Factory. Here are some of the awesome details that Kristen (Lil' Luna) put together. The cupcakes were delicious! 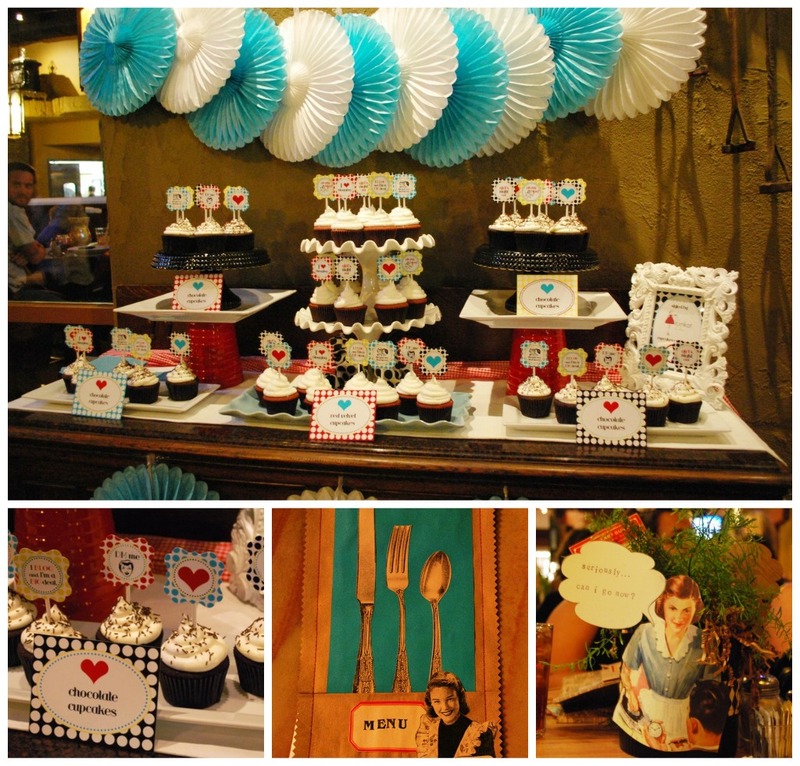 And the name tags, table settings, and menu cards were so cute! This was my end of the table at dinner. 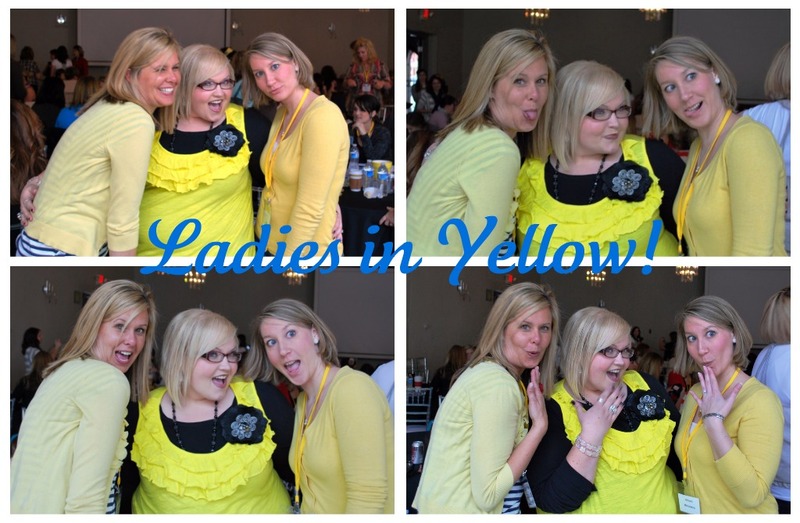 To start Day 2, April (Funky Vintage Lovely), Shelley (House of Smith's), and I all wore yellow so we had a little goofy photo shoot. I again sat with some awesome ladies! 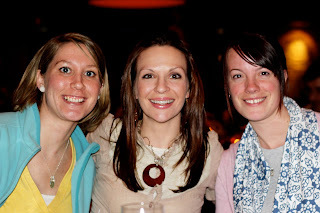 Kendra (My Insanity), Alison (Oopsey Daisy), and Amy (Positively Splendid). Becky Higgins, Megan (Brassy Apple), Melanie (Above All Fabrics) and Becki (Whippy Cake) discussed managing a business and motherhood. 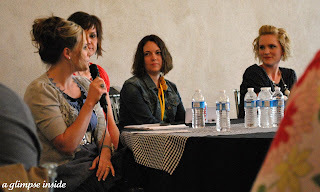 I then sat through a session about bringing your personality out through your blog with Char (Crap I've Made), Shelley (House of Smith's), and Stephanie (The Daily Blarb) and they were HIL-AR-IOUS!!! It was so fabulous! I got to meet so many of my favorite bloggers while attending this conference. It was AWESOME! Saturday afternoon Jen from Tatertots and Jello put on a little painting class. This is what I created. Not my best work but it was the best I could do with the time allotted. Saturday Night a few of us snuck out to do dinner on our our and celebrate Chrissy's Birthday. Ali (aPearantly Sew), Me, Alison (Oopsey Daisy), Trish, Chrissy (Hoot Designs), Gina (Hiya Luv), and Lauren (The Elephant's Trunk). After dinner, we headed back for the block party. 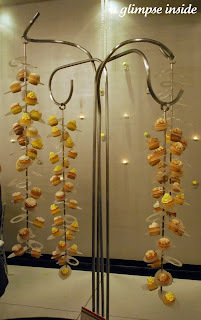 This was the creative cupcake display. It was so cool! I loved meeting everyone IRL but I still didn't meet everyone that I wanted too. All well- maybe next year! But it was so cool to see if everyone was the way they seemed on their blogs and with everyone I encountered, it seemed that way. I know I am missing stuff. It was a whirl wind weekend. And one of those wins was something AWESOME! I will have to write up a post just dedicated to all the swag and wins itself. 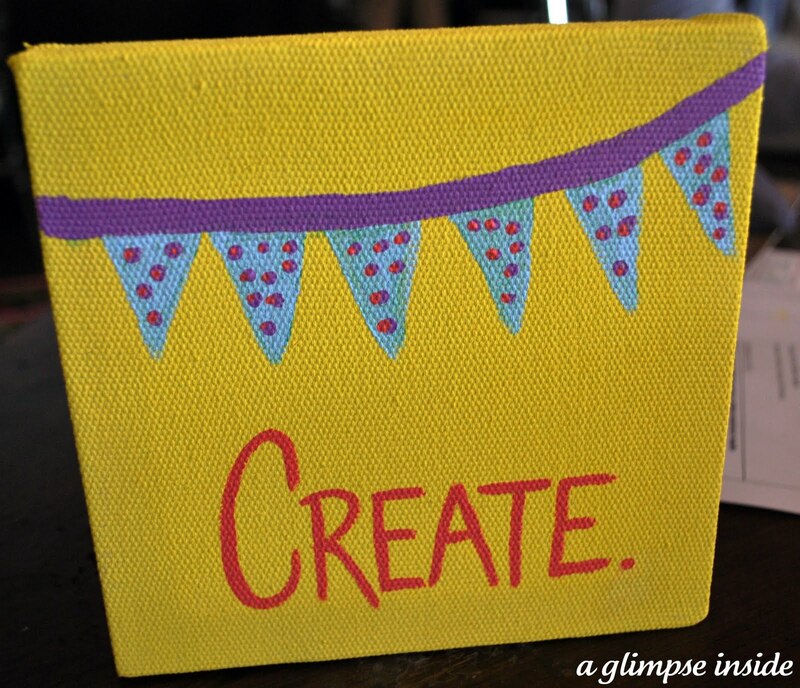 But if you didn't get to go to Creative Estates this year, here is some fun news for you. Creative Estates 2012 will in in Salt Lake City, Utah next April! It was so fun to meet the Alison/Allison's. I loved it. And our photo together is one of my faves. How BLUE are your eyes? So pretty! Great wrap-up. I love everyones different photos. I can never get enough photos! So great to finally meet in person. Oh man that looks like so fun! Maybe I will have to try to make it next year! Great post!! Dang, you got tons of pictures!! You must send me the pics you got of us! 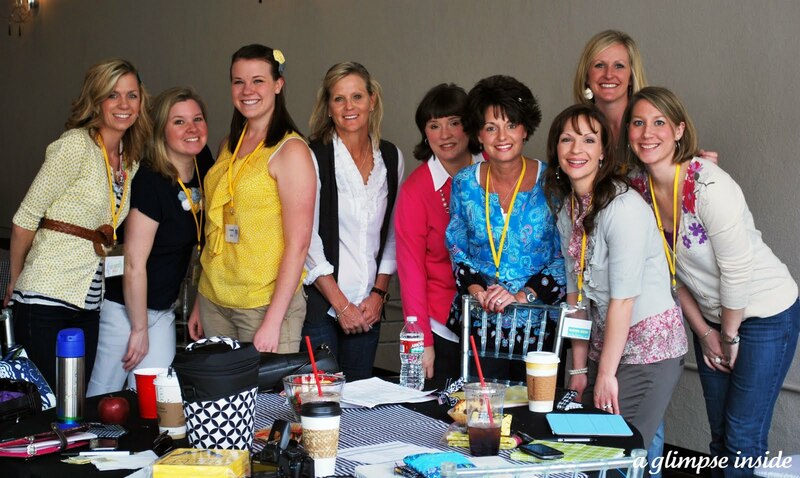 I love the one of our whole table the first day!! Love ya girl! These re-caps are making me miss everyone even more. Nice job. Your pictures make me smile just remembering all the fun times! And it is confirmed....I don't do sassy or goofy face. I need to work on that for next year. Promise, I'll have it down. But probably not as good as Shelley does! You are a cutie. I LOVE the bag you took to the conference!! Soo cute! Looks like you guys had tons of fun! wow. i wish i could of gone. 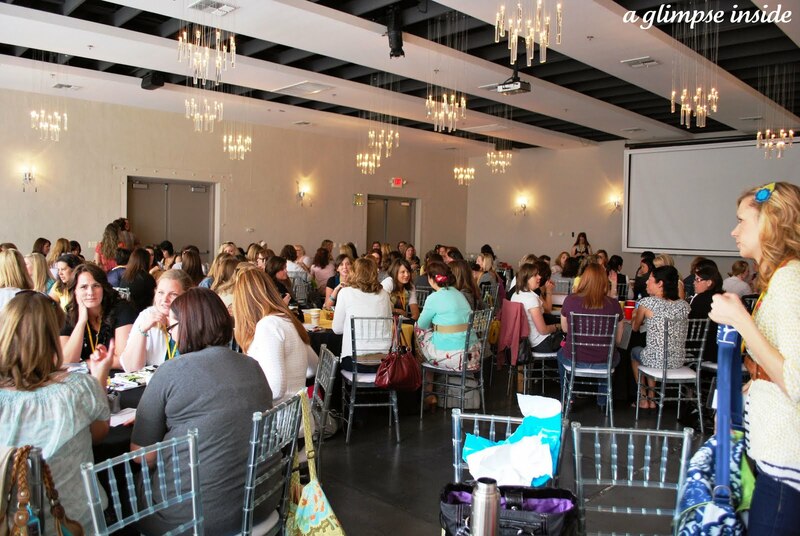 it looks alot more intimate than blissdom, which really appeals to me. thanks for the fun shout out about your bag. appreciate it more than you know! It was SO wonderful getting to meet you in person and give you a big hug! 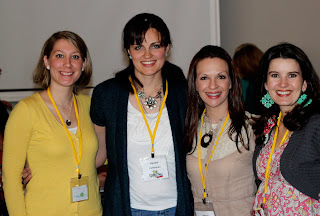 I can't believe the conference went by so quickly... it seemed to be over in the blink of an eye! But I had an absolutely wonderful, memorable time meeting you and everyone! 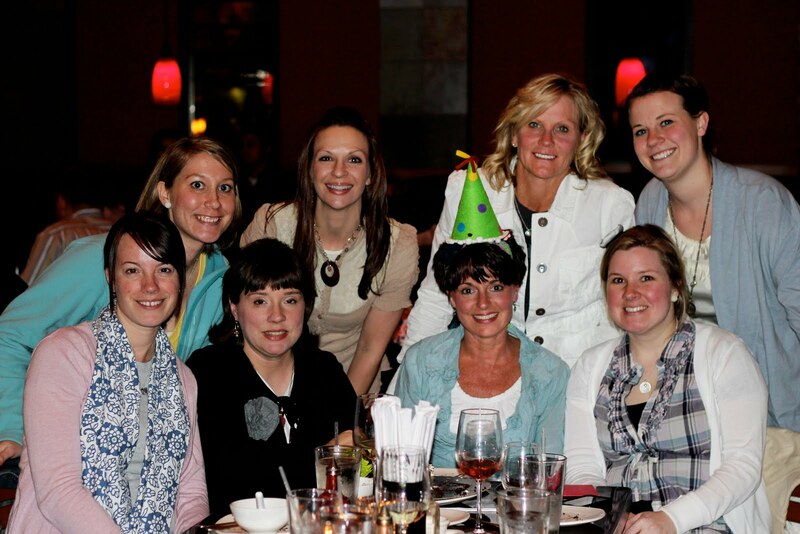 I'm so glad I got to meet you, and had the opportunity to have dinner with all of you lovely ladies! This post makes me miss everyone so much! Very cool and I love your bag! Was this something that anyone could go to or were you asked to go to? It looks like so much fun! 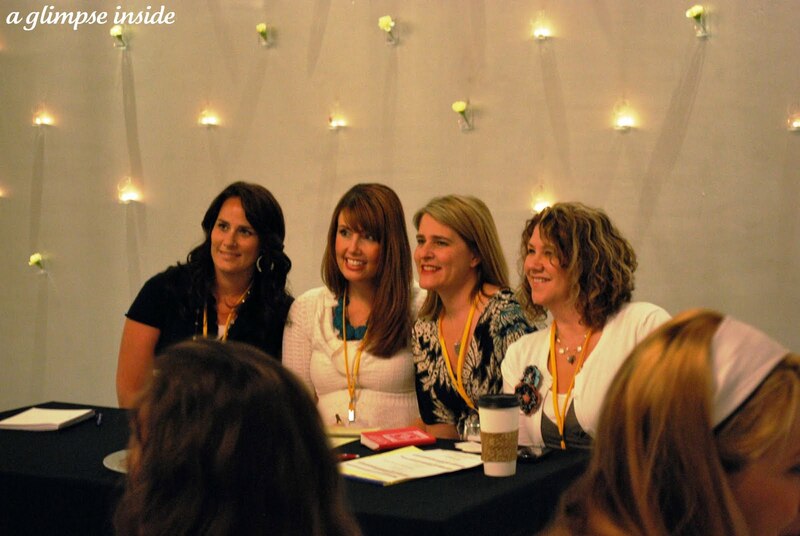 I want to go to Blissdom some day! Glad you had a fun time to get away before the packing begins! Good luck my friend! I can't wait to see what beautiful things you have in store for your new home! I am still regretting not getting a photo with you! Ah, well! It was fun to see you and get a hug still. you won three giveaways?? How fun is that!! Wish I did, I won one though and that was pretty cool :) Could you please send me the picture of us? It turned out better than I thought I did! 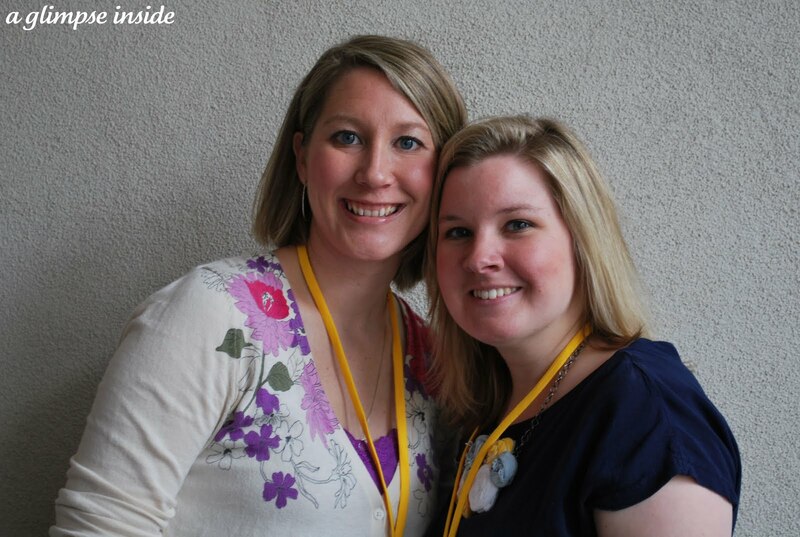 And of course, I loved having a travel buddy!! Always better to fly with someone to talk to!! 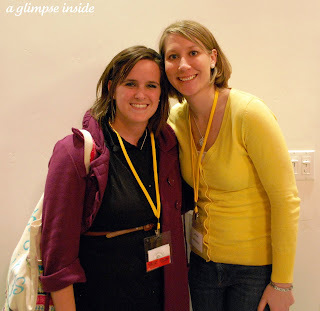 Allison, so glad that you were able to make it out to Creative Estates this year...I am going to go out on a limb and guess that since you were so "lucky," it was well worth your time! I know we didn't get to much of a chance to chat, but I have adored getting to know you on Twitter. I hope you will come visit next year in Salt Lake City. In the meantime, let's keep chatting! It was so fun to meet you Allison! 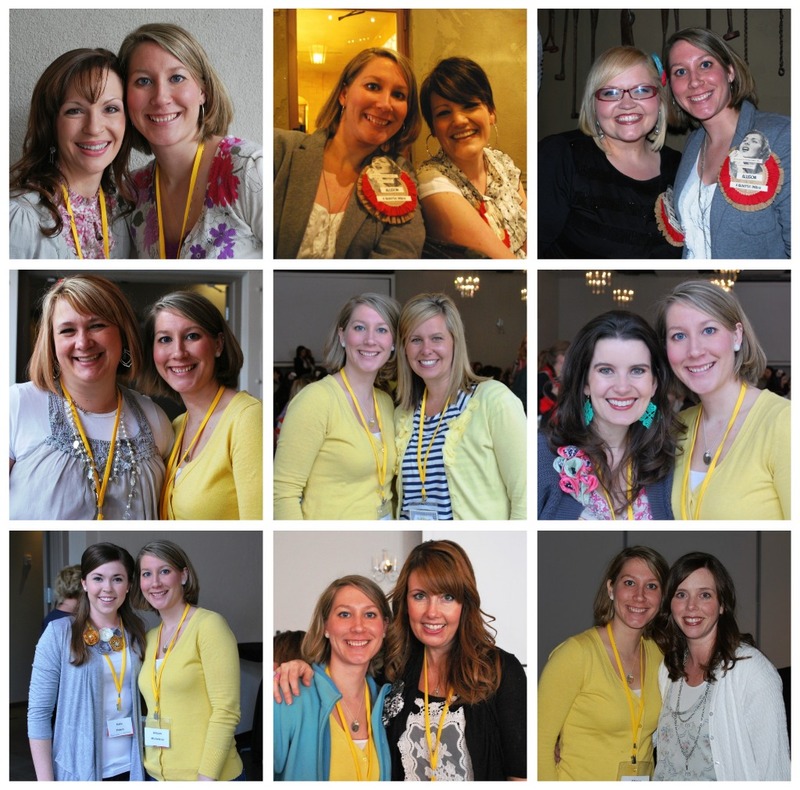 What a great recap of the conference! I love the yellow shirt TRIO! so cute! I am a firm believer that there is no such thing as too many pictures.